In the entire cichlid family, there is probably no other species that surpasses the aggressively and pugnaciously devoted parenthood of the African cichlids known as Jewel Fish. There are two species, known as Jewel Fish, the one we will discuss in this article and a larger species that is totally undesirable for the home aquarium called Hemichromis fasciatus. Hemichromis fasciatus grows to a length of ten inches and is found in Angola. This fish is rarely kept in an aquarium, for it is so aggressive that it presents a problem. In an aquarium, it tears up all the plants, digs holes everywhere, and attacks anything and anyone regardless of size during the mating and breeding season. It is not surprising that this fish has been nicknamed “wildcat since it is a wildcat among aquarium fish, a nickname it truly deserves. Stay far away from this species, unless you are an advanced cichlid enthusiast, you will not be successful with the Hemichromis fasciatus. 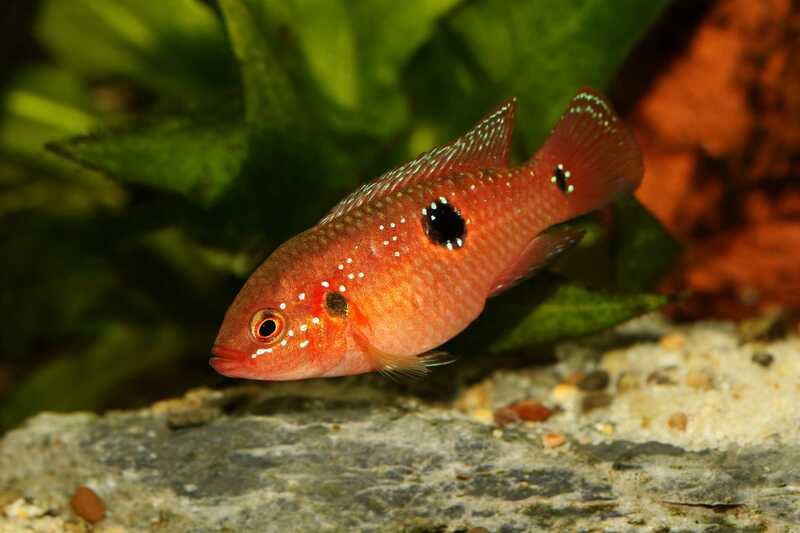 The Hemichromis bimaculatus or Jewelfish, also known as the Ruby Cichlid, is one of the aquarium staples for an entry fish into the cichlid end of the tropical fish hobby. This species is a much smaller fish that attains a maximum length of six inches, but usually averages only four or less than five inches full grown in captivity of an aquarium. The “Jewelfish” is available in almost every fish store and is attractive even as a young specimen. In addition, it is much more colorful than its larger relative, and perhaps not quite so fierce, although the Ruby Cichlid or Jewel Fish will unhesitatingly attack a man’s hand lowered into the tank and bite hard to discourage any threat to its young. This fish is definitely not recommended for a Community Aquarium unless it is a cichlid community aquarium. 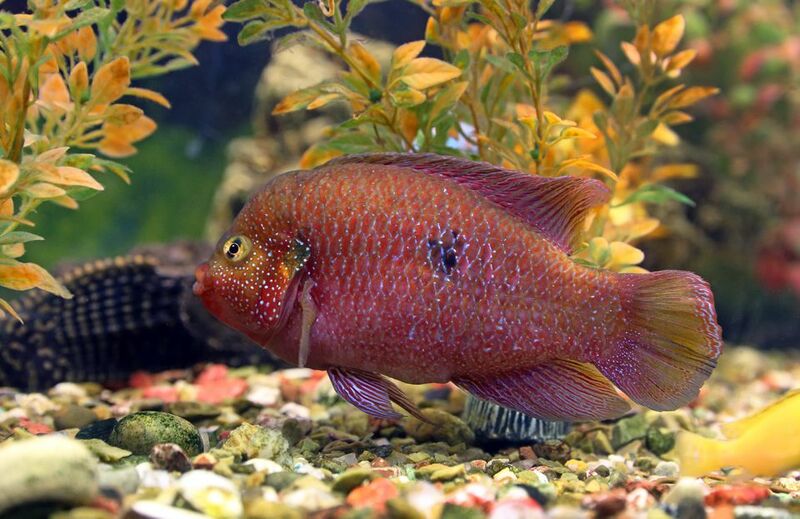 There are two variations available in pet stores, the Jewelfish is usually the original as it is in nature, and the Hemichromis lifalili Ruby Cichlid is usually a highbred variety much redder and somewhat more docile due to breeding out the aggressive nature of the natural variety. You should still not let the “Ruby” variety anywhere near your Community Aquarium, no matter what the salesperson says, they will eat your Neons and rip up your Angel’s without a doubt! Probably the most remarkable fact about the Jewel Fish, however, is the relationship of the mated couple, which comes as close to a “married life” in the full sense of the word as can be found among the fish available for the freshwater tropical fish hobby! The parents do everything together from preparing the nesting site to caring for the eggs and protecting the young. They share faithfully in all these tasks​ and spend a large part of each day during the breeding season in activities designed to give their offspring the best possible start in life. Their “family sense” and the way in which the couple sticks together and shares the work is as remarkable as the fact that the mated pair later remains together far beyond the time needed to get the new generation started. This has led some observers to wonder whether these fish, as well as closely related species that behave in a similar fashion, may become attached to their mates as individuals—that is, recognize their partners, and react to the substitution of different males or females. Although observations so far have not been conclusive, there seems to be some evidence that individual attachment among mated couples of certain cichlids appears possible. If for some reason the male or female should die, it is very likely that if another mate is introduced, the remaining fish will kill or badly damage the new arrival. Unlike Tetras or other shoal fish, Cichlids and especially Jewelfish should be bought in a pair. Get assistance in the store to pick a male and a female of the same size. In order to observe the entire sequence of breeding behavior without any disturbance, it is best never to have more than one male and one female of the species in the aquarium. At the breeding time, these fish are combatants, if they are not fully matched in size and strength, it may lead to injury or death of the smaller and weaker individual fish. However, once a pair is mated, once the ritual “fight”, which is presumably designed to determine strength and stability of a mating partner, they mate for life, the male will eventually be larger and will give his life to protect his mate. Always make sure that when a pair is introduced into a tank there is plenty of refuges such as rocks and plant thickets. A flowerpot placed in a dark corner will usually be the preferred site for spawning, which takes place in the usual cichlid manner. Habits: Besides being very pugnacious, the Jewelfish has the nasty habit of digging up plants. Size: Can grow to 4”-5”, but usually smaller. Food requirements: Live foods preferred, frozen foods accepted and should be given at least once per week; good high-quality flake food is fine for every day. A diet of all live or frozen proteins should be fed heavily for a week to induce breeding. Swims: Lower part of the aquarium comes off bottom only to feed and during breeding aggressions. Sexual maturity: 3 to 4 months or at about 2.5” they are fully able to mate, breed and raise fry. Hemichromis fasciatus. This species is commonly called Banded Jewelfish. This fish is twice the size or more of the Jewel fish, over 7 inches full grown and in the wild up to 8 inches. Hemichromis fasciatus grows to a length of ten inches and is found in Angola. This fish is rarely kept in an aquarium, for it is so aggressive that it presents a problem. In an aquarium, it tears up all the plants, digs holes everywhere, and attacks anything and anyone regardless of size during the mating and breeding season.